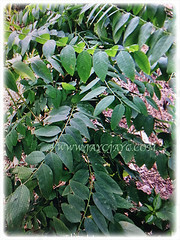 Botanical Name: Sauropus androgynus (syn. : Sauropus albicans). 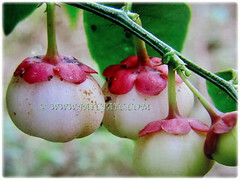 Common Names: Star Gooseberry, Sweet Leaf Bush, Katuk, Sayur Manis in Malay. Etymology: The genus name, Sauropus is from two Greek words, sauros and pous, meaning a foot. The species epithet androgynus is from the Latin word, meaning that both male and female flowers are produced on the same plant. Origin: Native to Borneo, Indonesia, Southwest China, South Asia and Southeast Asia. Plant type: A perennial and herbaceous shrub. Features: Sauropus androgynus is from the genus, Sauropus that comprises of about 40 species of herbs, shrubs or subshrubs with woody bases. A medium-growing tropical and herbaceous shrub with multiple upright stems that can reach between 2-3 m tall. 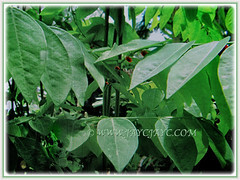 It bears dark green oval leaves 5-6 cm long. It is a shrub grown in some tropical regions as a leaf vegetable. It is slender with short lateral branching. 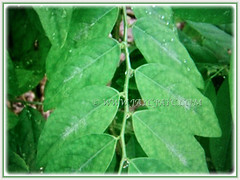 Its evergreen and petiolate simple leaves are oval, 4-5 cm long and are alternately arranged along the stems. Leaves are edible with slightly nutty or pea-like flavour. Stems are erect and somewhat woody. Flowers are monoecious, with separate unisexual flowers on the same plant. Its flowers are apetalous and small but prominently produced in leaf axils.Female flowers have 6 red sepals surrounding a single creamy-coloured pistil while male flowers have 6 creamy sepals enclosing 3 reddish stamens. It produces purple, red and white dehiscent dry fruit. 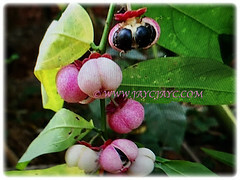 Fruits are white explosive capsules with persistent red calyxes and many black seeds, resembling small white mangosteens. Culture (Care): Sauropus androgynus or Star Gooseberry grows easily with the least maintenance. Soil: Fertile loamy, acidic and well-drained soils. Keep the soil damp. Others: Prune or harvest every few months to keep plant tidy and prevent lanky plants from falling over. Pruning also rejuvenates the plant which otherwise tends to die out. Feed it once a month or so with home-made compost or a balanced compound fertiliser to encourage rapid growth after harvest. Take note that the leaves should not be eaten raw as they are toxic. Generally free from serious garden pests. However, sometimes a small amount of leaf damage from leaf miner may occur. Sauropus androgynus or Star Gooseberry are hardy and cool season annuals, germinating early in the season. In tropical climates, the plant stays green year round, but in cooler climes, the bush will likely lose leaves in the winter only to regrow in the spring. The shrub blooms in the summer and fall with small, flat, round, yellow to red flowers in the leaf axil followed by a purple fruit with tiny black seeds. It takes two Katuk shrubs to pollinate and produce fruit. Its foliage is not affected by light frosts though the flowers are sensitive to freezing. In very cold zones a containerised plant can be brought inside for the winter months. Most will survive a very light frost and quickly return to normal in spring. Propagation: Easily propagated by stem cuttings which root easily. It can be propagated by seeds. Usage: Sauropus androgynus is a beautiful plant. 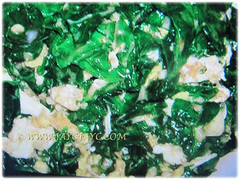 In Malaysia, it is commonly stir-fried with egg or dried anchovies. 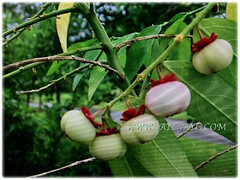 The flowers and small purplish fruits of the plant have also be eaten. Consumption of Sauropus androgynus has been reported as being associated with bronchiolitis obliterans. It is a traditional crop of Southeast Asia and a popular vegetable in Malay cuisine where leaves and young stems are eaten raw, steamed, boiled with beansprouts, cooked with eggs or added to soups. It is recommended to crush and soak the leaves in water to wash away the sap before cooking. 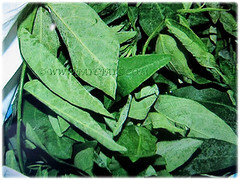 The plant especially its mature leaves is rich in minerals and vitamins. A recent trend sees growers force-feeding plants with extra fertilizers and water and using shade cloth to make them grow more rapidly, resulting in more tender shoot-tips that have few leaves and are asparagus-like in texture. Leaves are also used as food colouring in Indonesia. Flowers and fruits can be eaten as well. The plant contains considerable amounts of papaverine, an alkaloid acting as smooth muscle relaxant. Plants are used in folklore medicine. 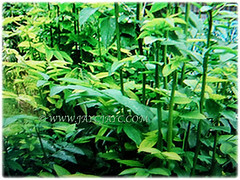 Pounded leaves and roots are applied as poultice to treat fever, cough and ulcers. It is commonly used as an effective medicinal herb in the treatment of diabetics, cancer, inflammation, microbial infection, cholesterol and allergy due to its antioxidant effect. Its leaves yield green dye which can be used as food colouring. Excellent because the bushes will form a hedge of edible leaves for year round consumption. Ideal to be planted in a flower pot or in the ground.